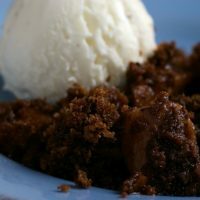 I shared one of my most well-received recipes a while back. It is so, so simple. Not that there’s anything wrong with that. It’s just that when you slave over something that is pretty involved, it’s a tiny bit disheartening when something you threw together in 10 minutes gets a better response. Overall, though, having a delicious dessert that’s also quick and easy isn’t such a bad thing. Traditionally, I make these with chocolate chips and peanut butter chips. Because Quinn was my reason for baking these, I let him have his say this time, and he wanted chocolate chips, caramel chips, and hazelnuts (about 3/4 cup). For an extra variation, I also used chocolate graham cracker crumbs. Looking at BoB, you may think that I bake all the time. I do bake frequently, and I love doing it. But, there are days when I’m just not up for it. That’s when recipes like these can be your best friend. While these are certainly not a culinary masterpiece, they are definitely good. And, what a great return on your time and effort! 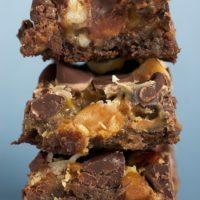 Double Delicious Cookie Bars are a sweet, simple combination of chocolate, caramel, nuts, and a gooey filling. Always a crowd-pleaser! Combine the cookie crumbs and butter. Press into the bottom of a 9″x 13″x 2″ pan. Pour the condensed milk evenly over the crust. Sprinkle the chocolate chips, caramel bits, and hazelnuts on top of the milk. Bake for about 25 minutes or until lightly browned. Cool completely in the pan before cutting into bars. I really enjoy your site, the photos and recipes are incredible…thanks for sharing!! Just wondering the caramel chips you are talking about; are these the Kraft caramel bits? they look utterly delicious! great addition with the hazelnuts. they work so well in these bars by giving a great crunch. Midge, thanks so much! I did use the Kraft caramel bits, chips, or whatever they’re calling them. They worked really well. Thanks, Amanda! I love hazelnuts. They really add something to these bars. LOL, Evelin! Some times the simplest things are the best. Your recipes are always winners! We call these Hello Dollies at our house, and my kids are crazy for them. I’ve never even thought to vary the ingredients, though, so I’ll have to give it a try! I like the chocolate graham cracker idea. Yum! In a way I wish they were really complicated to make so I’d be less tempted to make them and eat them all. Leslie, I think these have lots of different names. Varying the ingredients is a good way to clean out your pantry, too! Dianne, I know what you mean. I cut most of them into very small pieces so I didn’t feel quite so guilty. Rachel, I think the graham crackers really changed these from the original. Ashley, you definitely have a point. They may be *too* easy to make! Love the variations you can do with this bar. 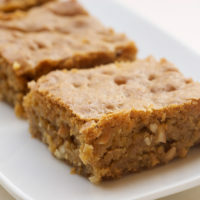 Love the caramel and chocolate graham cracker idea, too. Thanks, Tarah & Megan! Those chocolate graham crackers are great for the crust. I just got an email update to these and this picture opened up and my jaw dropped !! wow !! really stunningly divine looking cookies. Gotta make me some of those. 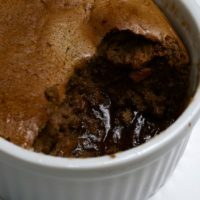 Every time I log onto your blog & see your latest photo & recipe, I just can’t help but feel that one is the best…then comes your next post & recipe & I think that one tops the previous one:) You are truly amazing—thanks for sharing your expertise with all of us! Wow, looks like you can just take a bite of the computer screen. Great close up shot! Love the recipe too. What chance do I have of upstaging that, brownie amateur that I am? Thanks, Kate! Those portrait pictures always seem huge on the site, but I love them. JEP, I don’t know that I have anything close to expertise, but thanks for the compliment! Jessica, these are so simple. You should give them a shot! That first pic is so decadent and wonderful! Those look incredible! Your photo makes me weep with longing, as I’m still holding firm to my new year’s diet! The first word that came to my mind was, heavenly. I love how beautiful the hazelnuts look. Wow, those look deadly. But in a good way! Thanks for the comment on my Flickr photo of gooey buns. I haven’t found the artisan bread book yet myself; I’ve just used the two recipes Jaden posted on SteamyKitchen.com (with the authors’ OK). So if you want to try the challah or caramel rolls, or mess around with the master dough otherwise, you can! Kitt, that’s a great description! Right after I lamented to you that I couldn’t find that book, Quinn let me know that he found it and ordered it. It just got here yesterday! Very excited. 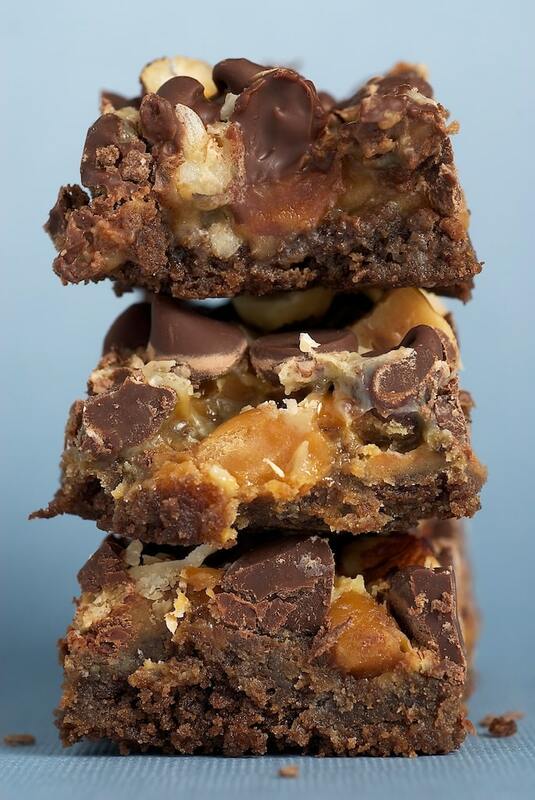 I am going to make these….I am wondering where you get chocolate graham crackers?? I have looked here in Canada and only find the oreo crumbs?? Is this what you are talking about?? Hendria, chocolate graham crackers are usually right next to the other graham crackers. I know that Nabisco makes them, and my local grocery store has a store brand as well. I’m sure Oreo crumbs or chocolate wafer crumbs would be more than fine. I couldn’t find chocolate graham crumbs here in China, but we do have Oreos. So I mashed up the peanut butter/chocolate filled oreos for the crust. Fortunately, we can get sweetened condensed milk at most every supermarket here. Then I did the cup (or more) of chocolate chips (or actually, a dark chocolate Dove bar…cheaper than the imported chocolate chips), peanuts and coconut for the topping. All that to say, I guess I mostly used your recipe as inspiration. But I think you could substitute a whole lot of things in this kind of recipe and come out with a winner. They were divine. Especially before they’d totally cooled and hardened. And our guests, both foreign and Chinese, really liked them. Jessica, your version sounds delicious! You’re absolutely right – these can be made with just about any combination of things. I’m glad you enjoyed them! *thud*…that’s my head banging on the screen….I neeeeed one now!! Thanks, Ali! I so like these bars. So, so simple yet incredibly good. Hello! Love your blog! 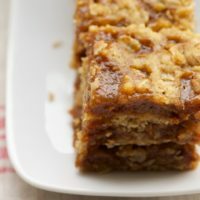 I’d like to prepare these bars but the link to recipe isn’t work anymore 🙁 Can you share the recipe? Hi, Yana. Here’s the original recipe. Enjoy! P.J., the recipe is in the original post. Here’s another link. I have a very similar recipe – it’s with Semi-sweet chocolate chips and Butterscotch chips- and no butter. You just mix the eaglebrand, both type chips and graham cracker crumbs in a bowl – then spread into a greased square pan and bake. They are my favorite! Can also add walnuts or hazelnuts on top before baking. I have also substituted Oreo crumbs for graham cracker crumbs – and it’s yummy too. Easiest recipe ever. 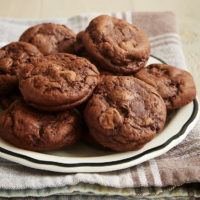 Hi, just stumbled upon your blog, these look delish!! I wanna try them but we don’t get peanut butter chips here and I’ve never used them before.. Can I substitute with peanut butter do you think? Hi, Sajy. 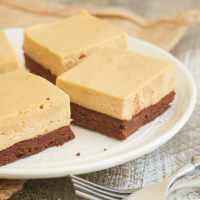 You can try a thin layer of peanut butter on the crust before adding the condensed milk. I’ve never tried that, so I can’t say that it will work well. 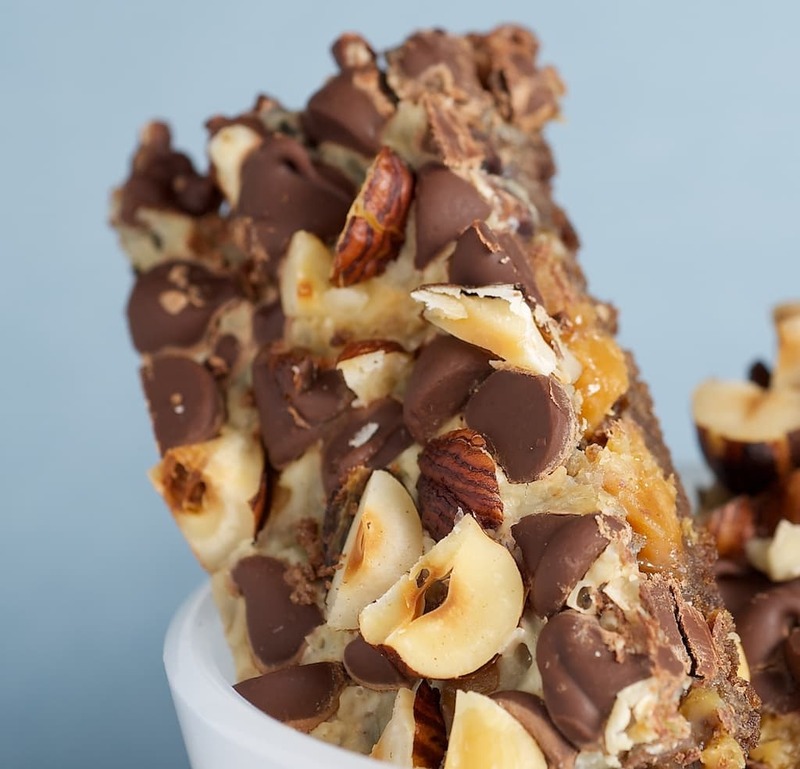 You could also make small dollops of peanut butter on parchment paper and freeze them, essentially making your own peanut butter chips to sprinkle on top of the bars. Again, I’ve not tried that, but it’s a possibility. Made these last week – big hit! Shared today on my blog! Thanks!